I now know why it's been difficult to snag an interview with Bishop Bernaba Yousif Habash since he was ordained the new bishop of the Syriac Catholic Eparchy of North America over two years ago. When we sat down for a face-to-face at his chancery and residence in Bayonne before Christmas, he told me he's not been in Bayonne for longer than two weeks since he took over June 11, 2010. "We are a missionary diocese," said Habash, 61, about his travels through the U.S. and Canada to visit some 40,000 parishioners spread over 18 parishes. He said 95 per cent of them are first generation Iraqis and have immigrated since the second Iraq War. Habash is only their second bishop. The founding bishop, Joseph Younan, was elected as patriarch of the Syriac Catholic Church of Antioch in January, 2009. In 1995, Archbishop Theodore McCarrick, then of Newark, welcomed the Syriacs to establish their chancery at first in Union City on Palisade Avenue. Archbishop John Myers turned over the former St. Joseph Church of Bayonne to become their cathedral and chancery. While Habash is grateful to be in Bayonne, it's not quite convenient for Syriac Catholics to worship there since few are in the area and getting there is not easy. But he also admitted that no matter where he settles, it will not be easy to attract too many of his flock since they are like a "diaspora." That's why he's racked up enough frequent flier miles probably to buy his own jet. And all the traveling is not normal for someone who spent most of his life in Iraq except for some theological studies in Lebanon. Born and raised in Iraq, Habash is an astute observer of the conflicts that erupted into the Iraq War. He admitted that Syriac Catholics were protected by the late dictator Saddam Hussein, but their numbers have been drastically reduced since the war started. He admits that it's not safe for him to travel in Iraq and while he's not afraid, he takes precautions. He attributes the fear among all Christians there to lawlessness. The Catholic Chaldean archbishop of Mosul, Paulos Faraj Rahho, was found dead in a shallow grave in 2009. On Feb. 29 of that year, Islamist extremists had abducted the 65-year-old prelate while he prayed the Lenten Stations of the Cross at his church. On Oct. 31, 2010, in the Syriac Catholic Church of Our Lady of Deliverance in Baghdad, more than 40 faithful were killed, including two priests, Rev. Thair Sad-alla Abd-al and Rev. Waseem Sabeeh Al-kas Butros, as they prayed with their people. 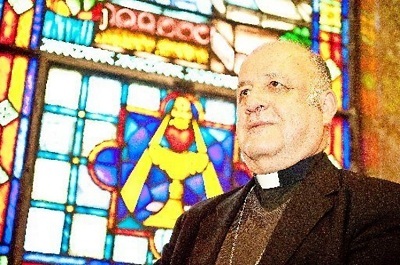 In 1979, Habash was appointed pastor of Sacred Heart Church in Basrah and patriarchal delegate for the Syriac Catholic communities in the Gulf Area, especially Kuwait. He worked closely with leaders of the Muslim community and was the bridge between the Nuncio of Baghdad and Shiite religious leadership in El-Najjif (central Iraq). Habash served in the Iraqi military and is fluent in five languages: Arabic, Aramaic, Kurdish, French and English. He is quite blunt with his opinions and resembles a prize fighter, almost inviting the listener to spar with him. Yet he's quite cordial and hospitable. He has only two laymen who serve as his secretary and manager of the house. Benedictine Father Luke Edelen serves as his chancellor. In October 1994, Habash was sent to the U.S. to assist with the formation of the new diocese and then became pastor of the mother parish, Our Lady of Deliverance, while helping start and sustain parishes in D.C., Allentown, Philadelphia, Boston and Providence. In 1999 he moved to Chicago and in 2001 to Los Angeles. These experiences enabled him to size up the U.S. and he found it "a most generous nation." But prior to coming here, he found the portrait of America "scary." "Americans were warriors," he said. Now that he is in the U.S. permanently, Habash's coat of arms gives a hint of how he'd like to transform the country. "Our mission is to venerate the heavenly values while at the same time sanctifying the earth in which we live."